It is a common characteristic of energy markets that prices and volatility tend to be positively correlated. However European hub price volatility is on the rise in 2014, and the cause has been a slump rather than a spike in gas hub prices. This is likely to have some interesting implications for the value of gas supply flexibility. It is a common characteristic of energy markets that prices and volatility tend to be positively correlated. This reflects the fact that price distributions tend to be skewed to the upside. Energy prices rarely go negative, but market shocks can cause explosive price spikes. However, European hub price volatility is on the rise in 2014, and the cause has been a slump rather than a spike in gas hub prices. This is likely to have some interesting implications for the value of gas supply flexibility. Hub price volatility has been at depressed levels for most of the last 3 years. There have been brief periods of price spikes caused by infrastructure issues over the last two winters. But market stability has quickly returned as an oversupply of flexibility dampened hub price reactions. 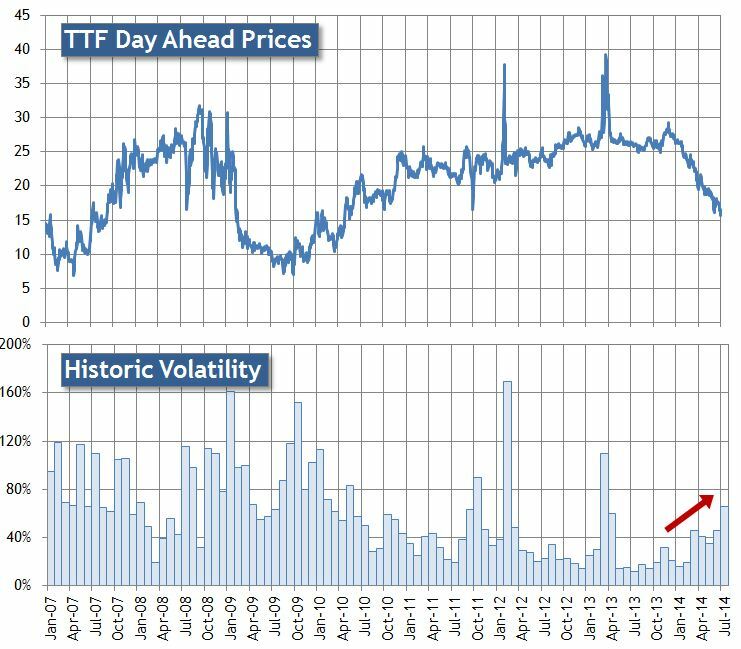 Chart 1 shows the evolution of day-ahead prices and historical volatility at the Dutch TTF hub (as a proxy for North West Europe). It can be seen from the volatility chart that day-ahead volatility ranged around the 80% level across the 2007-10 period. However over the 2011-13 period volatility slumped to levels below 40% (excluding the price spikes of Feb 12 and Mar/Apr 13 that we have previously addressed on this blog). A steady recovery in day-ahead volatility can be seen in 2014 as hub prices have rapidly declined. There is an intuitive explanation for the recent pickup in hub price volatility. The market has been in a reasonably subdued ‘steady state’ over the 2011-13 horizon with hub prices loosely tracking oil-indexed contract prices and healthy levels of portfolio supply flexibility. The sharp reduction in hub prices in 2014 represents the European gas market breaking out of that state of relative stability (as we set out last week). The associated increase in uncertainty around future price levels (assisted by the ongoing Russia – Ukraine dispute) and associated impact on portfolio exposures, is reflected in price volatility as players adjust their portfolio positions. The 2014 price slump has to a large extent caught the market by surprise and price volatility is rising as a result. In addition some of the key providers of gas supply flexibility are currently relatively constrained. For example oil-indexed contract swing is out of the money given low hub prices and seasonal storage capacity across Europe is relatively full. The oversupply of gas portfolio flexibility and associated slump in volatility over the last three years has dampened market interest in flexible assets and flexibility products. Gas storage capacity has been particularly hard hit as both seasonal spreads and volatility have declined. But there has been a renewed interest in supply flexibility as 2014 has developed, particularly in mid to fast cycle storage capacity. Fast cycle storage is best placed to take advantage of value opportunities from prompt price volatility. For example taking advantage of the temporary price spike after Russia announced it would cut Ukranian supply or the price dips as high volumes of LNG have flowed into hubs. The widening of the seasonal spread between Summer 14 and Winter 14/15 also represents a stronger price signal for the seasonal utilisation of slower cycle storage assets. This reduces the competition that fast cycle storage faces from seasonal facilities in providing shorter term deliverability. The available capacity product range sold by mid to fast cycle storage buyers has improved over the last few years as new facilities have come online. There may be a significant increase in liquidity of these products if the 2014 recovery in prompt volatility continues. This is our last article before the Blog takes a summer break. We will be back towards the end of August. In the meantime have a warm and relaxing summer..